Manufactured and imported from France, Top Rolling Papers are one of the top selling papers on the tobacco market today. Easily recognized for its classic light-yellow package with the blue TOP logo on it, these rolling papers are very popular in the Midwest due to its traditional taste and quality. 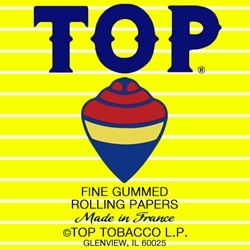 Top Rolling Papers has remained a best seller in the tobacco community from its first release until today. Smoking enthusiasts everywhere have grown to appreciate how good quality Top rolling papers are. Here at Smokers Discounts we believe you will too! We’ve made it easy and affordable to buy tobacco products online. Call us for more details!